Vince Gilligan is about to break bad again — this time in an even bigger way. Per The Hollywood Reporter, Breaking Bad series creator Gilligan is developing a feature-length film set in the Breaking Bad universe. Gilligan is attached as screenwriter and executive producer, and may even step up to direct as well. Mark Johnson and Melissa Bernstein, who executive produced Breaking Bad and its spin-off series Better Call Saul, are also on board. Sources close to the outlet confirmed that the project is in development, but it remains to be seen whether the Breaking Bad movie is a prequel in the vein of Better Call Saul or a sequel that picks up after the unforgettable Breaking Bad finale, and whether it will score a theatrical run or simply play out on the small screen, premiering on the original series' network AMC. Likewise, it's unknown if Gilligan will tap Breaking Bad actors Bryan Cranston and Aaron Paul to reprise their respective roles as Walter White and Jesse Pinkman for the film. The only semi-concrete piece of information we have regarding the Breaking Bad movie is that it will reportedly "follow the escape of a kidnapped man and his quest for freedom" — but even that hasn't been corroborated. Rumor has it that the film is currently operating under the unconfirmed (read: possibly fake) working title of Greenbrier. According to the New Mexico Film Office (via Albuquerque Journal), a Sony project carrying that title is gearing up to film later this month in New Mexico, the state in which Breaking Bad shot a majority of its episodes. That production will reportedly "follow the escape of a kidnapped man and his quest for freedom." While no one involved with the Breaking Bad movie has confirmed or denied that Greenbrier is the actual film, the logline about a man forging a new path after being held hostage sounds like it could connect to the fate Paul's Jesse faced at the end of Breaking Bad. In the finale episode, Jack Welker (Michael Bowen), the uncle of Todd Alquist (Jesse Plemons) and the leader of a White Supremacist Gang, brings a shackled Jesse to his compound, where Walt intended to meet them. There, Jesse and Walt actually gain the upper-hand, as Walt uses a remote-controlled machine gun he planted in his car to take down Jack's gang and the pair kill Jack and Todd themselves. Just before Walt succumbs to the injury he sustained in the crossfire, Jesse nods at the man who changed his life (sometimes for better, sometimes for worse), then begins crying and laughing as he drives away. Gilligan has previously stated that he left Jesse's story open on purpose so that fans could decide what would actually happen to him after the series ended. "We always felt like the viewers desired Jesse to get away. And it's up to the individual viewer to decide what happens next for Jesse. Some people might think, 'Well, he probably got two miles down the road before the cops nailed him,'" Gilligan told Entertainment Weekly in September 2013. "But I prefer to believe that he got away, and he's got a long road to recovery ahead, in a sense of being held prisoner in a dungeon for the last six months and being beaten to within an inch of his life and watching Andrea [Jesse's ex-girlfriend, played by Emily Rios] be shot. All these terrible things he's witnessed are going to scar him as well, but the romantic in me wants to believe that he gets away with it and moves to Alaska and has a peaceful life communing with nature." 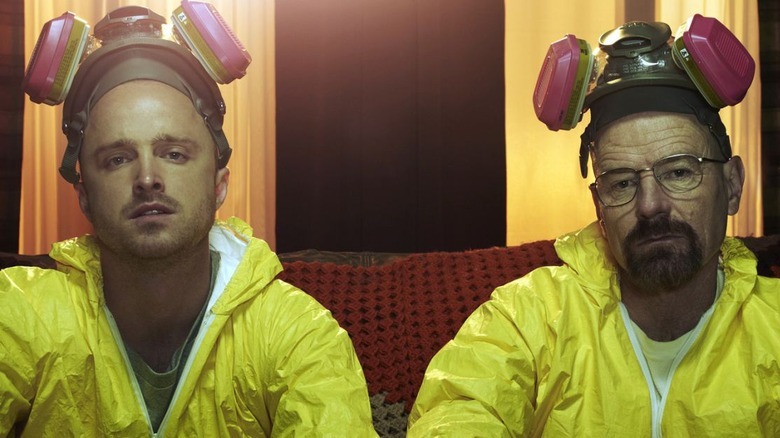 If the Breaking Bad film and Greenbrier really are the same project, as the available evidence seems to indicate, there's a good chance that viewers might get to see Jesse Pinkman grace their screens again, discover his ultimate fate, and watch as he attempts to gain complete freedom and carve out a new life for himself. This is, of course, just speculation for now, since so much mystery and uncertainty surrounds the project right now and since there are so many different ways in which Breaking Bad could come back to life. Check back with Looper for ongoing updates on the Breaking Bad movie as more information becomes available.